Still playing catch up. Here is my take on night sky. 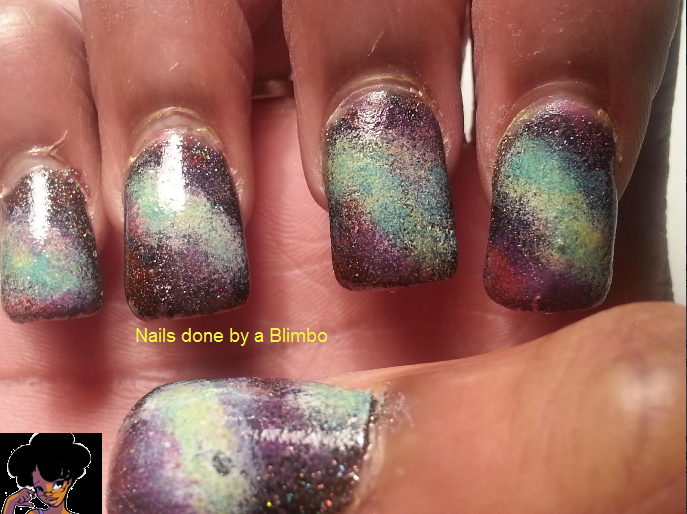 I have done galaxy mani’s before and wanted to try it in a different way. 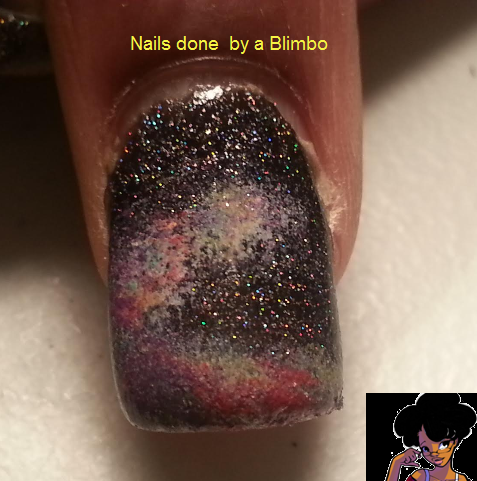 I got the idea to try the galaxy french from Nail Art 101. 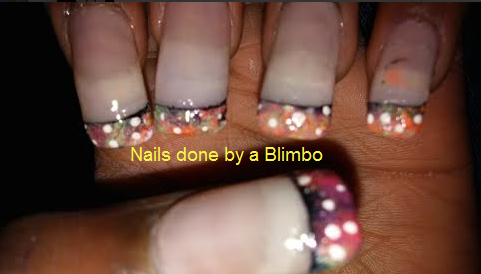 Ignore the blob of orange on my pinky. 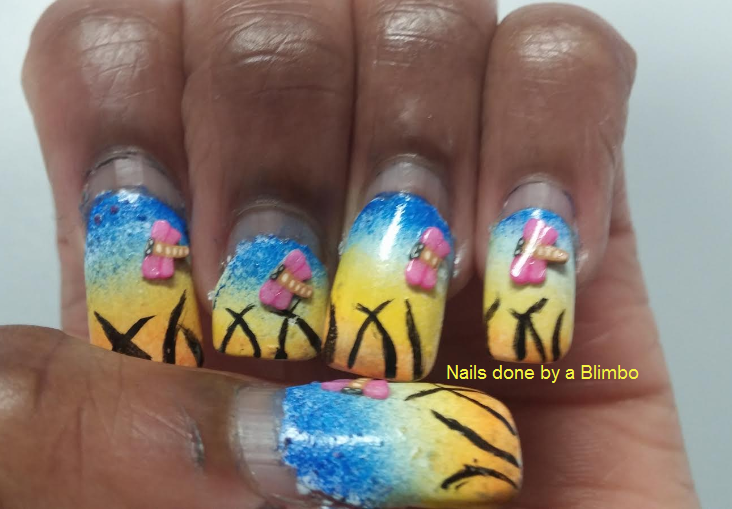 Yay, I knocked another nail art design from the WAH Book of Nail Art. 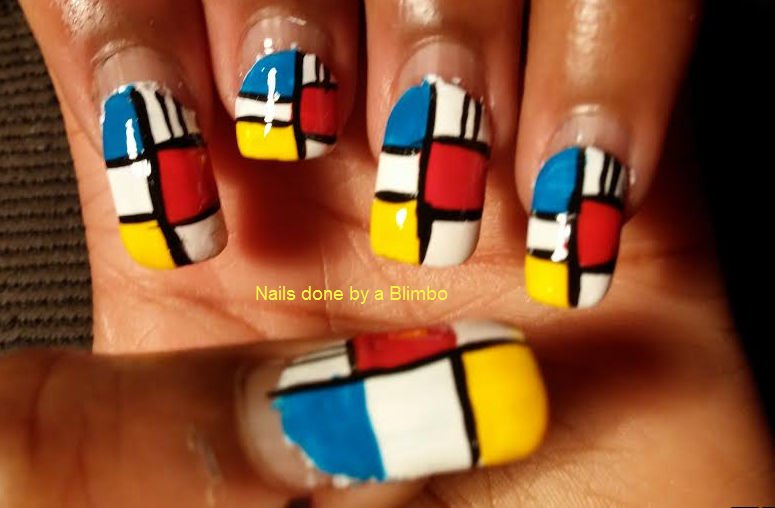 This one was inspired by the painter Piet Mondrian. 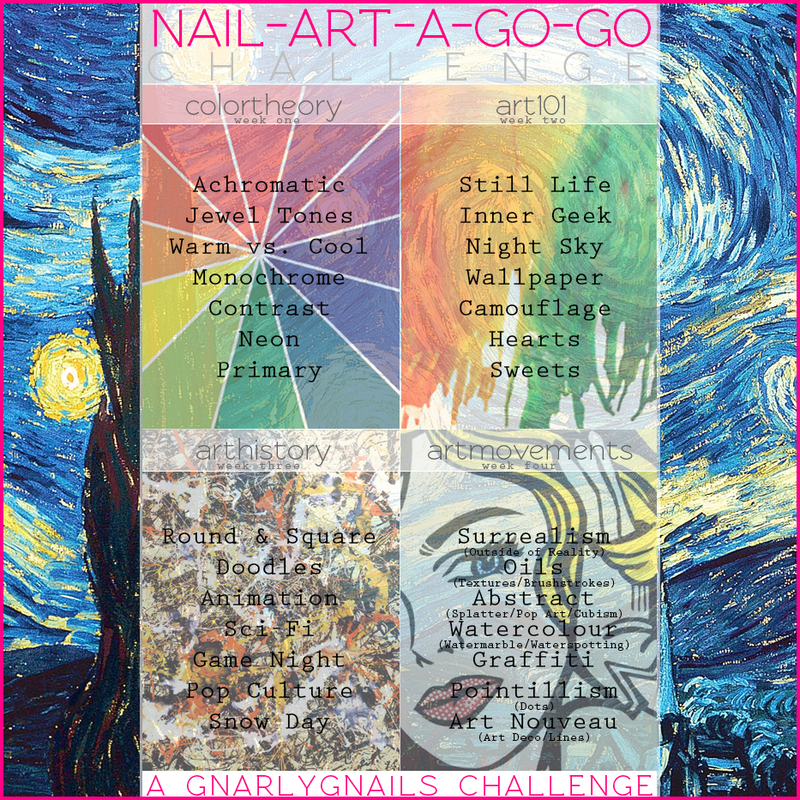 OK finally back to doing a daily nail art challenge! I feel that this one is way out of my league as I have no art skills whats-so ever. Well it can’t hurt to try. First up Achromatic, no lie I gad to look this up as I had no idea what it was. What it actually means is the absence of color( Thanks Google). 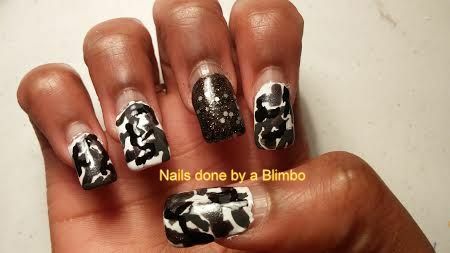 For today I did a black, grey, and white camo design with black and white glitter accent nail. I was trying again to try and do a equalizer on my nails and again I failed. 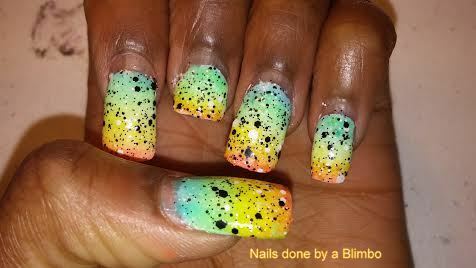 This time I spaced my colors out to far on my sponge when I was doing the gradient part. I ended up liking the way It looked so decided to just keep it the way it was then start all over. 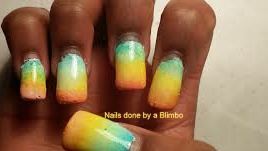 Here is the gradient on its own. 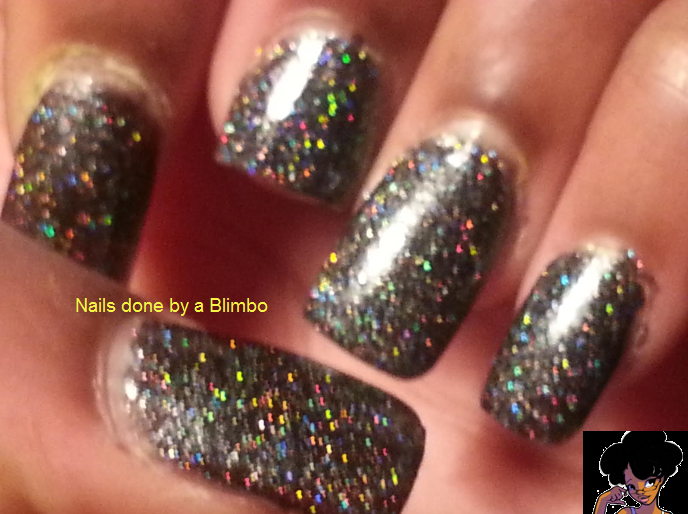 After looking at it I decided to put some black and white glitter over top of the gradient. It gives it a more edgy look. I just recently got drafted onto a official pool tear ( also know as billiards in other counties). I can not play pool, but they needed a low number ( I would start off as a 3) so I said I would help out. WHAT DID I TALK MYSELF INTO !!!!!!!!!!!! I know the gist of the game get balls in the pocket, but there is so much more to it. Balls have to touch rail a certain amount of times or your ball can not touch this ball if it did not hit this ball. My new teammates and others are trying to teach me the things I do not know and what I am doing wrong so far. I am scared shitless as our first match is tomorrow and I still don’t know 100% what I am doing. I don’t want to let my team down , but they keep telling me to have fun and just make the balls in the pocket don’t worry about any fancy stuff right now. This will be the first time that I am on a team competing for something ( trip to Vegas to play if we make it that far) and will have everyone watching my every move. 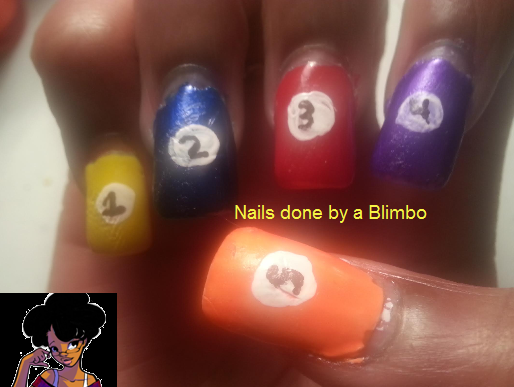 I decided to do some pool nails to get myself into the mood for tomorrows match, who knows they might not need me to play yet as it is a strategy thing and it depends on who the other team puts up to play. My nails did look nice when I put the top coat on, but then my puppy sister came over with my mom and did not notice my nails smudged till she left. 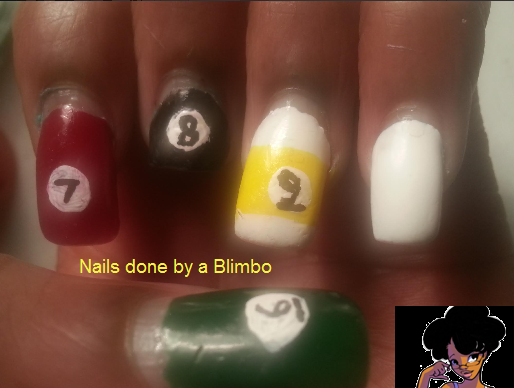 We are playing 9 ball so we have to get the balls in the pockets in numeral order so I did my nails in all the ball colors and included the cue ball. So I am no longer doing any more overtime at the warehouse, but the call center is still crazy. I needed a pick- me up yesterday so I went to Claire’s to buy some nail polish. 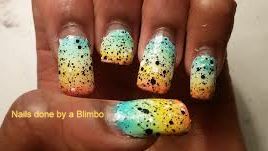 I immediately noticed Bright Lights Big City which is a gorgeous holo black polish that has a slight texture matte finish, I took one look at it and said galaxy mani. 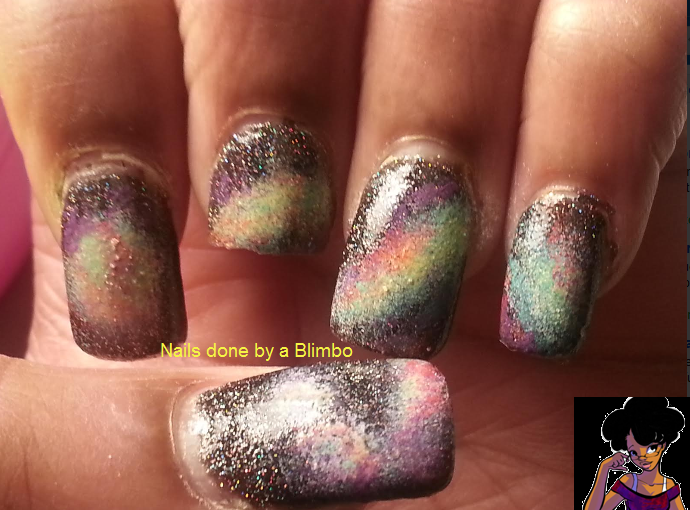 I finally see what a true holo polish looks like and am in love with all the colors of the rainbow. 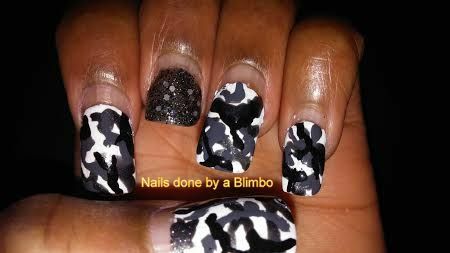 I’m sure that everyone had a favorite nail when they do these mine was my thumb.